Alphonse Legros original etching "La Mort et le Bucheron"
Medium: original etching. 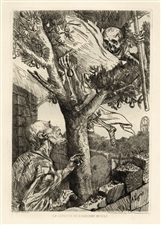 The French title "La Mort et le Bûcheron" translates to "Death and the Woodcutter". This is a rich impression on laid paper with full original margins, in excellent condition, printed by A. Salmon and published in Paris by L'Art in 1876. Size: 12 3/4 x 9 1/2 inches (plate) -- 326 x 240mm. Signed by Legros in the plate (not by hand). Jean-Francois Millet was another artist who also explored the same theme of Death and the Woodcutter. 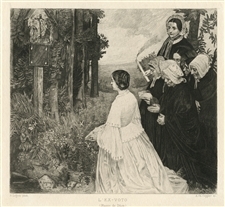 This piece is probably Legros' most famous etching. Alphonse Legros original etching "L'incendie"
Medium: original etching. This is a rich, dark impression on laid paper with full original margins, printed by A. Salmon and published in Paris by L'Art in 1876. Size: 9 1/2 x 10 7/8 inches (plate) -- 240 x 275mm. Not signed. Alphonse Legros original etching "La Legende du Bonhomme Misere"
Medium: original etching. This impression on Arches laid paper printed in 1880 for Philip Gilbert Hamerton's very scarce "Etching and Etchers", issued in an edition of 1000. Plate size: 9 x 6 inches (230 x 153 mm) with good margins. Signed by Legros in the plate (not by hand). Alphonse Legros original etching "The Wayfarer"
Medium: original etching. Executed in 1885; this is a good impression with full original margins on watermarked laid paper from "The Portfolio" edition, published in London by Seeley, Jackson & Halliday and edited by 19th Century artist and art critic Phillip Gilbert Hamerton. The plate measures 5 7/8 x 10 3/4 inches (150 x 273 mm). Signed by Alphonse Legros in the plate, not by hand. Condition: there is creasing in the margins, not affecting the etched image. 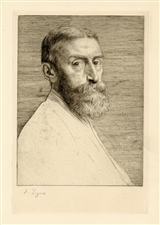 Alphonse Legros original etching "Sir Edward Poynter"
Medium: original etching. Executed in 1877; this is a good impression with full original margins on laid paper from "The Portfolio" edition, published in London by Seeley, Jackson & Halliday and edited by 19th Century artist and art critic Phillip Gilbert Hamerton. The plate measures 10 x 6 3/4 inches (255 x 173 mm). Signed by Alphonse Legros in the plate, not by hand. 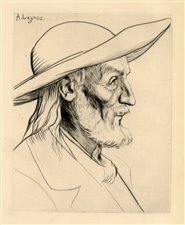 Alphonse Legros original etching "Paysan Breton"
Medium: original etching. Executed ca. 1880; this is a good impression with full original margins on laid paper from "The Portfolio" edition, published in London by Seeley, Jackson & Halliday and edited by 19th Century artist and art critic Phillip Gilbert Hamerton. The plate measures 8 3/4 x 7 inches (220 x 175 mm). Signed by Alphonse Legros in the plate, not by hand. Alphonse Legros original etching "Extase poetique"
Medium: original etching. Catalogue reference: Sanchez and Seydoux 1876-18. Printed on laid paper in Paris by A. Cadart and published by the Gazette des Beaux-Arts in 1876. Plate size: 8 1/4 x 6 inches (210 x 152 mm). Not signed. Condition: there is a narrow margin on the right side. Medium: etching (etched by A. Coppier after Legros). This impression on laid paper was printed in 1903 and published in Paris by the Gazette des Beaux-Arts. The image measures 5 1/2 x 6 1/4 inches (140 x 155 mm). Signed in the plate, not hand-signed. Condition: there is foxing in the margin. Medium: original etching. This impression is printed on heavy wove paper with wide margins. Plate size: 4 1/2 x 3 1/4 inches. Signed by Legros in the plate (not by hand).